The Sting-Rays were formed in North London in 1981. A year later they signed to Ace Records and in 1983 they released their first LP on Ace's subsidiary label Big Beat. Titled Dinosaurs, it was a savage record very influenced by The Cramps, Meteors, obscure '60s garage punk bands such as The Novas and The Emperors and by the garage psych sound of The Chocolate Watch Band, 13th Floor Elevators and The Count Five. Their broad musical knowledge, along with cover artwork that avoided horror movie imagery and surly humor, set them apart from the other bands in the psychobilly scene. During this first garage-billy period, the band was formed by Keith Cockburn on bass, Alec Palao on drums (future member of The Sneetches and renowned music compiler for Ace Records), Mark Hosking on guitar (later of The Earls Of Suave and The Flaming Stars) and Bal Croce as vocalist (also of The Earls Of Suave). 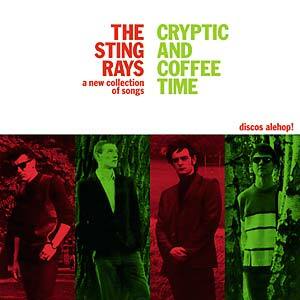 After three singles on Big Beat and a live album for Media Burn Records, in 1987 they released Cryptic and Coffee Time. It was a four-year gap since their debut, and during that time the Sting-Rays sound had made a pronounced turn towards pop, where their love for the '60s focused now on folk-pop and psychedelia, creating a new sound which linked them with contemporary British bands such as The Dentists or Television Personalities. It's precisely Joe Foster (a member of the latter) who released their second LP (and a four-track 12") on his Kaleidoscope Sound label. Three of the founding members remained in the line-up: Bal, Mark and Alec Palao. The new member was bass player Johnny Bridgewood (a member of Morrissey's band from 1991), who wrote one of the songs on the record. Cryptic and Coffee Time has been described by some as "the saddest record ever." This statement is based on its lyrics, which completely abandon the escapist and caveman-like imagery of the psychobilly and garage genres and deals instead with more introspective and profound concerns. But don't be afraid, the music is far from dark, slow, tormented and mature. On the contrary, it is energetic and raw, bursting with fuzz guitars and the teenage spirit of garage-punk-pop. The album opener, "Behind the Beyond" is a pop anthem, a chorus from beginning to end, a true hit that was released, in a different version, on a 12" with three other tracks from the LP sessions. It's followed by "Hopelessness of the Human Race," full of distortion, keeping a certain connection with their garage beginnings. Their trademark psych-pop bursts in unexpectedly with "Don't Sell Yourself Short." "Bitterness" is calmer, an acoustic ballad that brings to mind Love and The Pale Fountains. The band goes back to cubist psychobilly on "The Big Lie" and right after they throw the listener off with a power-pop track titled "Through the Dawn." Rounding up the first side of the LP, "Reason Nor Rhyme" is a psych-pop instrumental with crystalline 12-string guitar picking à la Byrds, but with an abrasive fuzz background. Side 2 opens with "The Burden of Dreams," pure English beat soul with piano which is reminiscent of Madness. "The Big Tide Will Turn" is another garage-pop concession to their older fans. "Middle Age Spread" recalls Love again, but at full-throttle. "I'm Growing Old" starts slow, with a soft-pop vibe similar to Everything But The Girl, but the melody ends up speeding up and merging with an obsessive-progressive bass line. The initial guitar picking of album closer "All These Years" immediately brings to mind the playful and jumpy pop of Monochrome Set. It's time to rediscover a record that doesn't belong to any specific genre, created by a group of music fans who passionately offered a repertoire full of hits that got lost, forgotten about, left alone without a scene that would give them a home, waiting to be rediscovered in a future time which is now the present. Other releases on DISCOS ALEHOP!